Our 90ga 20" x 5000' Blown Stretch Wrap has excellent puncture resistance for securing irregular loads. Blown Film has superior cling for keeping pallet loads secure. Our 20" x 5000' x 90 Ga Blown Machine Stretch Film easy to use roll increases efficiency, and the clear 20 in. 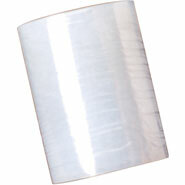 hand stretch film enables easy identification during shipping.